Now that the kids are back in school for the year, it’s time to get serious about putting the summer havoc back into some sort of order before the holidays. Once kids get settled into a new routine, they tend to do really well with it, but making a change can be a challenge. It’s good to introduce new elements of organization to them gently over time instead of with a great deal of change at once if you want the concepts to stick. 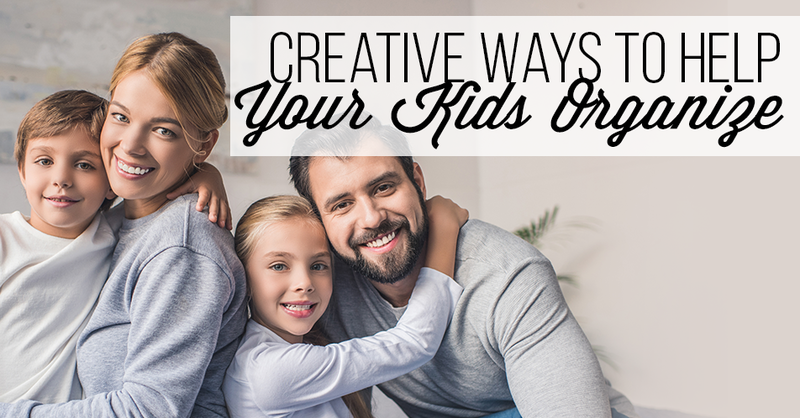 Here are some creative ways that you can get your kids engaged with making a more organized, structured household. Crayons, coloring pencils, glue sticks and more tend to be found all over the place, and often underfoot! Keep your sanity by creating a cute craft caddy; a little bucket with separate sections that are ideal for keeping everything organized and together and can be easily stored right on your desk for easy retrieval when your kiddo wants to get creative. One of the most challenging things to handle is being sure your kids make it to school on time. Whether they’re headed on to the bus or catching a ride to school, there are almost always missing pieces of clothing or shoes at the last minute. Keep final-seconds rushing to a minimum when you section off a part of their bedroom furniture for school clothes. Even one drawer where you let them get everything together for the week and separate it in the drawers can work wonders for your relationship with your child. Kids love to have plenty of places to roam in their room, which can be tough if they’re tripping over their furniture. Replace single-use items with some that do double-duty, such as beds that have a pull-out bed or drawers underneath to save storage or bed sets that also include a desk or spots for storage. This will not only provide additional places for storage but also let your child have more space available to run and romp in their room. Bookshelves are a great organization tool for your home. Don’t limit yourself to thinking of strictly book storage. Consider all the different ways that you can use this versatile piece of furniture. Plus, as your child grows they can be a great storage spot for awards and recognition, too. Getting organized doesn’t have to be a drag. When you create fun activities that keep your little people involved, they will appreciate being able to always go to the same spot to find their books, toys and favorite clothing items. Get all the resources you need for organization at Wickmans Furniture! Contact us today at 818-991-4800 or via email to WickmansLifestyle@gmail.com. Our friendly and knowledgeable associates will help you find exactly the items that you need to bring peace and calm back to your home.